For the 20th-century rock guitarist, see Mick Ronson. 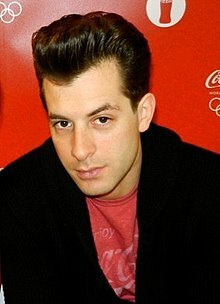 Mark Daniel Ronson (born 4 September 1975) is a British-American musician, DJ, songwriter, and record producer. Ronson is best known for his collaborations with artists such as Amy Winehouse, Lady Gaga, Adele, Lily Allen, Miley Cyrus, Queens of the Stone Age, and Bruno Mars. He has received seven Grammy Awards, including Producer of the Year for Winehouse's album Back to Black and two for Record of the Year singles "Rehab" and "Uptown Funk". He received an Academy Award, a Golden Globe Award and a Grammy Award for co-writing the song "Shallow" for the film A Star is Born (2018). In 2014, Ronson released his single "Uptown Funk" featuring vocals from Bruno Mars. The single spent 14 consecutive weeks at number one on the U.S. Billboard Hot 100, seven non-consecutive weeks at number one on the UK Singles Chart and became one of the best-selling singles of all-time. His fourth studio album, Uptown Special, became his most successful album to date. In 2018, he founded his own label, Zelig Records (an imprint of Columbia Records), and formed the duo Silk City with fellow producer Diplo, for which he received the Grammy Award for Best Dance Recording for the song "Electricity". Mark Daniel Ronson was born 4 September 1975 Notting Hill, London, to Jewish parents Laurence Ronson, a real-estate speculator and music manager, and Ann Dexter. His ancestors emigrated from Austria, Lithuania and Russia. He was brought up in a Masorti Jewish household and had a Bar Mitzvah. The Ronson family had been one of Britain's wealthiest families in the 1980s, but they lost $1 billion of their money in the property crash of the early 1990s. He is the nephew of businessman Gerald Ronson. Through his mother, he is also related to British Conservative politicians Sir Malcolm Rifkind and Leon Lord Brittan, as well as Odeon Cinemas founder Oscar Deutsch. He is not related to the late English guitarist Mick Ronson. After his parents divorced, his mother married Foreigner guitarist Mick Jones, which contributed to a childhood surrounded by music. Ronson has twin sisters who are two years younger: Charlotte Ronson, a fashion designer, and Samantha Ronson, a singer and DJ. He also has five younger half-siblings: Alexander and Annabelle from his mother's marriage to Mick Jones, and Henrietta, David, and Joshua from his father's marriage to model Michele First. Ronson, along with his mother, stepfather, and twin sisters, moved to New York City when he was eight years old. Living on the Upper West Side of Manhattan, he counted Sean Lennon among his childhood friends. He attended high school at the private Collegiate School in Manhattan before attending Vassar College and then New York University. In 2008, he obtained American citizenship so that he could vote in that year's election. Mark made the leap from DJ to producer after Nikka Costa's manager heard one of his sets and introduced the musicians. Ronson produced Costa's song "Everybody Got Their Something," and Ronson soon signed a record contract with Elektra Records. He had already produced tracks for Hilfiger ads and, in 2001, used the connection to have Costa's single "Like a Feather" used in an advertisement. Ronson's debut album, Here Comes the Fuzz, was released in 2003. Despite poor initial sales it was generally well received by critics. As well as writing the songs on the album, Ronson created the beats, played guitar, keyboards, and bass. The album featured performances from artists from diverse genres, including Mos Def, Jack White, Sean Paul, Nappy Roots and Rivers Cuomo. The lead single and best known song from the album, "Ooh Wee," samples "Sunny" by Boney M and features the rappers Nate Dogg, Ghostface Killah, Trife Da God, and Saigon. The song charted at number 15 on the UK Singles Chart and was used in a number of films, including in Honey (2003) and on its soundtrack. Two weeks after releasing Here Comes the Fuzz, Elektra Records dropped him. In 2004, Ronson formed his own record label, Allido Records, a subsidiary of Sony BMG's J Records, along with his longtime manager Rich Kleiman. The first artist he signed to Allido was rapper Saigon, who later left to sign with Just Blaze's Fort Knox Entertainment. He has signed Rhymefest, most well known for winning the Grammy for co-writing Kanye West's "Jesus Walks." On 2 April 2007, Ronson released a cover of The Smiths' track "Stop Me If You Think You've Heard This One Before" under the title "Stop Me", featuring singer Daniel Merriweather. It reached number 2 in the UK singles charts, giving Ronson his highest-preaking single until 2014's "Uptown Funk". Ronson remixed the Bob Dylan song "Most Likely You Go Your Way And I'll Go Mine" in promotion for the three disc Bob Dylan set titled Dylan released October 2007. Ronson has also produced Candie Payne's "One More Chance (Ronson mix)" in 2007. The album Version was well received by critics particularly in the UK and US. In May 2007 it was awarded the title Album of the Month by the British dance music magazine, Mixmag. On 23 June, Ronson made the cover of the Guardian newspaper's Guide magazine, alongside singer Lily Allen. In June 2007, Ronson signed DC hip hop artist Wale to Allido Records. In late 2007, he focused on production, working with Daniel Merriweather on his debut album, and recording again with Amy Winehouse and Robbie Williams. On 24 October 2007, Ronson performed a one-off set at The Roundhouse in Camden, London as part of the BBC Electric Proms 2007. The performance featured the BBC Concert Orchestra and included special guests Terry Hall, Sean Lennon, Tim Burgess, Alex Greenwald, Ricky Wilson, Charlie Waller, Adele and Kyle Falconer. In December 2007, Ronson received his first Grammy Award nomination, for 'Producer of the Year, Non Classical'. Ronson's work with Amy Winehouse also received substantial accolades, gaining 6 nominations. Winehouse's "Back to Black" album, mostly produced by Ronson, was nominated for 'Album of the Year' and 'Best Pop Vocal Album'. Her song "Rehab" received nods for 'Best Female Pop Vocal Performance', 'Song of the Year' and 'Record of the Year'. Ronson would go on to win three Grammys: 'Producer of the Year' as well as 'Best Pop Vocal Album' and 'Record of the Year' (the latter two of which he shared with Amy Winehouse) in early February 2008. Ronson is credited as producer on a mixtape album called Man in the Mirror, released in January 2008 by the rapper Rhymefest which is a tribute to the pop star Michael Jackson. The album features Rhymefest appearing to speak to Michael Jackson using archive audio from interviews with the pop star. The same month Ronson received three nominations for the Brit Awards, including 'Best Male Solo Artist,' 'Best Album' (Version) and 'Song of the Year' ("Valerie"). Ronson won his first Brit for 'Best Male Solo Artist' in mid February 2008 over favourite Mika. He also performed a medley of "God Put a Smile upon Your Face" with Adele, "Stop Me" with Daniel Merriweather and "Valerie" with Amy Winehouse. The performance allowed for a large boost in sales in the iTunes UK Top 100. "Valerie" would jump almost 30 spots in the days after the event, while "Just", "Stop Me" and "Oh My God" all appeared in the chart as well. That same week, Ronson appeared twice in the UK Top 40, with "Valerie" rebounding to number 13 and "Just" at number 31, his fourth Top 40 entry from "Version". The Brits performance also allowed for "Version" to climb 18 spots to number 4. Around this time, Ronson received his first number one on an international chart (Dutch Top 40) for "Valerie," which spent four consecutive weeks at the top of the chart. He collaborated with Kaiser Chiefs on their third album. Ronson toured the album "Version" extensively through both the UK and Europe during 2008. Notable sold out performances at The Hammersmith Apollo and Brixton Academy. Ronson is known to champion new upcoming artists on the road with him, such as Sam Sparro and Julian Perretta. Ronson's string backing was provided by the all-female string quartet Demon Strings. In May 2008, Ronson played at the largest private party in the world, the Trinity Ball in Trinity College Dublin. On 2 July 2008 in Paris, Mark Ronson performed live with Duran Duran for an invited audience. They played new arrangements by Ronson of some Duran Duran songs, along with tracks from the band's new album, Red Carpet Massacre. Ronson & the Version Players also performed songs from his album Version. Simon LeBon sang. As of March 2009 Ronson was working with the group on their 13th album. The Album, titled All You Need Is Now, was released digitally exclusively via Apple's iTunes on 21 December 2010, while the physical CD was released in March 2011 with additional tracks. In 2013–14 Ronson was once again in the studio producing Duran Duran's 14th album, Paper Gods, making it the first time the band have worked with the same producer on consecutive albums since Colin Thurston produced their first two albums in the 1980s. In the Spring of 2010, Ronson confirmed the name of his new album Record Collection, and said that he hoped to have it out by September 2010. Additionally, Ronson announced the name of his new band, "The Business Intl. '", which is the alias adopted by Ronson on the third studio album. The first single "Bang Bang Bang". which featured rapper Q-Tip and singer MNDR was released on 12 July 2010, where it peaked at number 6 on the UK Singles Chart, giving Ronson his fourth Top 10 single. The single also entered the Irish Singles Chart, where it peaked at number 18. The second single from the album, "The Bike Song", was 19 September 2010 and features Kyle Falconer from The View and Spank Rock. The album was released on 27 September 2010. This is the first Ronson albums on which he features as a singer. Although Ronson had never met Michael Jackson he was given the vocal track to a song titled "Lovely Way", sung by Michael Jackson, in 2010 to produce for Jackson's posthumous album Michael. He submitted the track, but it did not make the track listing for Michael. Ronson said about the rumours surrounding the vocals on the track (due to the controversy surrounding the Cascio tracks on that same album), "It was definitely him singing. I was given a vocal track to work with but I never actually met Michael. [...] It's in the vein of Elton John's 'Goodbye Yellow Brick Road' and John Lennon's 'Imagine'." He provided the score for the 2011 film Arthur. Ronson was one of the artists featured in the 2012 documentary Re:GENERATION Music Project. His song "A La Modeliste" features Mos Def, Erykah Badu, Trombone Shorty, members of The Dap-Kings, and Zigaboo Modeliste. On 30 October 2014, Ronson announced, via Twitter, a new single from his upcoming album, to be released on 10 November 2014. The single, "Uptown Funk," features Bruno Mars on vocals. On 22 November 2014, Ronson and Mars appeared as the musical guest on Saturday Night Live performing "Uptown Funk" and "Feel Right" (featuring Mystikal). "Uptown Funk" reached number one in the UK and US singles charts, and also became the all-time most streamed track in a single week in the UK, having been streamed a record 2.49 million times in a week. "Uptown Funk" reached the top 10 in nearly every country it charted; it spent fifteen weeks at number one on the Canadian Hot 100, fourteen weeks at number one on the Billboard Hot 100, and seven weeks at number one on the UK Singles Chart. In February 2015 the song won Ronson the Brit Award for British Single of the Year. As of December 2018, the song's music video on YouTube has amassed over 3.4 billion views. In 2015, Ronson starred in the documentary film Amy about his late friend Amy Winehouse. His voice features in the film where he talks about his career and relationship with Winehouse and there is footage of Ronson from the recording session of the single "Back to Black" from March 2006 and also at Winehouse's funeral in London in July 2011. On 16 October 2015, Ronson became a patron of the Amy Winehouse Foundation. In January 2016, Ronson was nominated for two Brit Awards; Best British Male Solo Artist, and British Producer of the Year, at the 2016 Brit Awards. At the 2016 Grammy Awards Ronson won two awards for "Uptown Funk", including Record Of The Year. Jason Iley, the head of Sony Music UK and Ronson's UK label Columbia Records, hailed Ronson as "a true gentleman" and "one of the most considerate, kind and humble artists in our industry." He added "the monumental success of Uptown Funk is so thoroughly deserved, and has established itself as, not only one of the Records Of The Year, but of our lifetime." He went on to executive produce Lady Gaga's fifth album Joanne. Ronson produced the Queens of the Stone Age's 2017 album Villains. In May 2018, it was revealed through Instagram that Ronson had been working with American singer, Miley Cyrus on her upcoming 7th studio album." Their first collaboration together debuted with the release of "Nothing Breaks Like a Heart"  Ronson also co-wrote the song "Shallow" for the film A Star is Born with his frequent collaborators Lady Gaga, Andrew Wyatt, and Anthony Rossomando. The song earned Ronson an Academy Award and the Golden Globe Award for Best Original Song, as well as two Grammy nominations, winning the Grammy Award for Best Song Written for Visual Media. On April 12, 2019 announced that Mark Ronson is set to release his fifth album "Late Night Feelings," on June 26. The album is set to feature Miley Cyrius Lykke Li and Camila Cabello. Ronson has described the album as a collection of "sad bangers," with the title track laying down a warm mid-tempo dance groove under Li's melancholy vocals. Ronson divides his time between London, Los Angeles and New York. Since childhood, he has been a fan of English Premier League football club Chelsea F.C., and has also been a fan of the New York Knicks basketball team. In 2009 he participated in PETA's "Please Don't Wear Any Fur" campaign. In 2009 Ronson was voted the most stylish man in the UK by GQ magazine. In 2015 he was named one of the magazine's 50 best dressed British men. In 2011, a portrait of Ronson was painted by British artist Joe Simpson; the painting was exhibited around the UK, including a solo exhibition at the Royal Albert Hall in London. In 2002, Ronson began dating the actress-singer Rashida Jones. They became engaged in March 2003, with Ronson proposing by creating a crossword puzzle with the message "Will you marry me." Their relationship ended approximately one year later. On 3 September 2011, Ronson married French actress and singer Joséphine de La Baume, who had previously appeared in the music video for "The Bike Song". On 16 May 2017, it was reported that de La Baume had filed for divorce from Ronson, listing the separation date as 21 April 2017. The divorce was finalized in October 2018. Since 2018, he has been in a relationship with Saturday Night Live crew member Rebecca Schwartz. In 2017, Lastrada Entertainment claimed that "Uptown Funk" infringed the copyright of Zapp & Roger's 1980 hit song "More Bounce to the Ounce". A total of three lawsuits had been filed by different parties. Ronson created a video, along with Directors Gary Breslin and Jordan Galland: Circuit Breaker, which is an homage to video game The Legend of Zelda: A Link to the Past. In 2001, Ronson appeared in the Aaliyah music video "More Than A Woman" as a DJ. 2001: Nikka Costa – "Everybody Got Their Something"
2014: Mark Ronson featuring Bruno Mars – "Uptown Funk"
2015: Action Bronson featuring Chance the Rapper – "Baby Blue"
2015: ASAP Rocky featuring Rod Stewart and Miguel – "Everyday"
2015: Duran Duran featuring Janelle Monáe and Nile Rodgers – "Pressure Off"
2016: Various Artists – "Hands"
2016: Lady Gaga – "Perfect Illusion"
2016: Lady Gaga – "Million Reasons"
2017: Lady Gaga – "Joanne"
2018: Mark Ronson featuring Miley Cyrus - "Nothing Breaks Like a Heart"
2018: Mark Ronson featuring Lykke Li - "Late Night Feelings"
^ "Mark Ronson | Music Biography, Credits and Discography". AllMusic. 4 September 1975. Retrieved 16 July 2014. ^ "Mark Ronson Gets U.S. Citizenship for Presidential Election". People.com. Retrieved 4 February 2019. ^ Collar, Matt. "Mark Ronson Biography". Archived from the original on 3 May 2018. Retrieved 26 February 2019. ^ "The Royal Ronsons". Harper's Bazaar. 10 August 2008. Archived from the original on 17 January 2015. Retrieved 13 January 2015. ^ "Guilt & Pleasure". Guiltandpleasure.com. 26 September 2007. Archived from the original on 10 December 2013. Retrieved 16 July 2014. ^ Westbrook, Caroline (7 March 2007). "Mark Ronson Interview". DailyJews.com. Archived from the original on 16 July 2011. Retrieved 16 July 2014. ^ Kilbinger, Sara Seddon (25 May 2005). "Heron Chief Takes His Cue From Hollywood". The Wall Street Journal. ^ "The man Amy and Lily go to when they want a hit". The Times. London. 27 January 2008. Retrieved 12 May 2010. ^ Sansom, Ian (26 June 2010). "Great dynasties of the world: The Dexter-Joneses". The Guardian. London. Archived from the original on 24 July 2019. ^ Somaiya, Ravi (12 August 2007). "Mark Ronson: The Forrest Gump of hip-hop?". The Telegraph. London. Archived from the original on 4 December 2014. Retrieved 13 January 2015. ^ Doyle, Tom (May 2007). "Mark Ronson". Sound on Sound. Archived from the original on 14 August 2018. Retrieved 16 January 2016. ^ Sellers, John (29 September 2010). "Tough Questions for Mark Ronson". Spin. Archived from the original on 14 August 2018. Retrieved 16 January 2016. ^ "Mick Jones of Foreigner: Songwriter Interviews". Songfacts.com. 23 October 2009. Retrieved 16 July 2014. ^ Petridis, Alexis (6 October 2007). "Cover boy". The Guardian. London, UK. Retrieved 12 May 2010. ^ Byrne, Suzy (6 February 2014). "Foreigner's Mick Jones Reminisces About Opening for the Beatles". Yahoo! Music. Retrieved 16 July 2014. ^ Caramanica, Jon (22 April 2007). "How Mark Ronson Went From D.J. to White-Soul Producer". New York. Archived from the original on 26 February 2019. Retrieved 3 August 2011. ^ "Mark Ronson Gets U.S. Citizenship for Presidential Election". People. 12 February 2008. Archived from the original on 17 May 2017. Retrieved 4 February 2019. ^ "Mark Ronson Shows Off His 'Record Collection' on New Album". Billboard. 30 August 2010. Retrieved 26 January 2011. ^ "Electric Proms 2007 – Mark Ronson and special guests with the BBC Concert Orchestra". BBC. Retrieved 16 July 2014. ^ "Mark Ronson: 'New Kaiser Chiefs album echoes debut'". NME. 5 May 2008. Retrieved 28 May 2008. ^ "Entertainment | Duran Duran recording with Ronson". BBC News. 3 July 2009. Retrieved 16 July 2014. ^ Zane Lowe. "Zane Lowe's Hottest Records blog: Hottests Record: Mark Ronson and The Business Intl' – 'Bang Bang Bang'". BBC. Retrieved 16 July 2014. ^ "The Bike Song: Mark Ronson: Amazon.co.uk: MP3 Downloads". Amazon.com. Retrieved 16 July 2014. ^ "Interview with Mark Ronson". Lifelounge. 9 February 2011. Archived from the original on 11 February 2011. Retrieved 9 February 2011. ^ "Mark Ronson's Michael Jackson track 'definitely' features King of Pop's vocals". NME. 6 November 2010. Retrieved 6 November 2010. ^ Lopez, Korina (16 February 2012). "Musicians mix genres in 'Re:Generation' documentary". USA Today. Tysons Corner, Virginia. ISSN 0734-7456. Archived from the original on 23 December 2015. ^ Robbie Daw (30 October 2014). "Mark Ronson Announces 'Uptown Funk' Single, Featuring Bruno Mars". Idolator. Retrieved 1 November 2014. ^ Wright, Callum (28 December 2014). "Mark Ronson's Uptown Funk breaks all-time streaming record!". Official Charts Company. Retrieved 23 December 2014. ^ "Mark Ronson 'happy' to be Amy patron". BBC. 18 October 2015. ^ "Lady Gaga's 'Joanne': Mark Ronson on Producing 'Raw and Exposed' New Album". Rolling Stone. Retrieved 12 October 2017. ^ "Queens Of The Stone Age Release New Song, 'The Way You Used To Do'". Npr.org. National Public Radio. Retrieved 16 June 2017. ^ Christine Werthman. "Chartbreaker: King Princess On Working With Mark Ronson and Finishing Her Debut Album Within the Year". Billboard. Retrieved 26 January 2019. ^ "Mark Ronson". Grammy Awards. Retrieved 26 January 2019. ^ Legaspi, Brittany Spanos,Althea; Spanos, Brittany; Legaspi, Althea (30 November 2018). "See Miley Cyrus' Wild Police Chase in New 'Nothing Breaks Like a Heart' Video". Retrieved 4 February 2019. ^ "Golden Globe Nominations: Complete List". Variety. 6 December 2018. Retrieved 6 December 2018. ^ "Oscar Nominations 2019: The Complete List". Variety. 22 January 2019. Retrieved 22 January 2019. ^ "Mark Ronson Shares Track Listing And Release Date For "Late Night Feelings," Featuring Miley Cyrus, Camila Cabello". Top40-Charts.com. 12 April 2019. Retrieved 13 April 2019. ^ "Mark Ronson – my die hard passion for the New York Knicks". Purple Revolver. 23 January 2013. Retrieved 16 July 2014. ^ "PETA's Blog | PETA". Blog.peta.org. Retrieved 16 July 2014. ^ "Ronson Tops Fashion List". Contactmusic.com. 1 April 2009. Retrieved 16 July 2014. ^ "50 Best Dressed Men in Britain 2015". GQ. 5 January 2015. Archived from the original on 7 January 2015. Retrieved 7 February 2015. ^ "Rashida Jones: Biography". TV Guide. Retrieved 2 October 2008. ^ Abel, Olivia (17 March 2003). "Passages". People. Retrieved 1 July 2009. ^ "Mark Ronson marries Josephine de la Baume in Provence". The Telegraph. 3 September 2011. Retrieved 15 January 2015. ^ "And the groom wore candy stripes! Mark Ronson marries his French bride Josephine de la Baume in romantic Provence". Daily Mail. 5 September 2011. Retrieved 15 January 2015. ^ "MARK RONSON WIFE CALLS IT QUITS Wants Spousal Support". tmz.com. 16 May 2017. Retrieved 16 May 2017. ^ Harrison, Lily (28 December 2018). "Mark Ronson and Joséphine de La Baume Settle Their Divorce". E! News. ^ Waddell, Lily (27 November 2018). "Mark Ronson, 43, and new love interest Rebecca Schwartz get lost in a passionate kiss as they are seen together for the first time in NYC". Daily Mail. London. Retrieved 11 January 2019. ^ Nast, Condé. "Mark Ronson Settles "Uptown Funk" Zapp Copyright Lawsuit". Pitchfork.com. Retrieved 4 February 2019. ^ Transmissions, Souterrain. (15 May 2010) Mark Ronson's Circuit Breaker (Homage to Zelda) – Video Download on Vimeo. Vimeo.com. Retrieved 3 August 2011. ^ "Aaliyah: Angel So Fly". The Fader. 25 August 2011. Retrieved 2 March 2017. ^ "Lady Gaga Announces New Single, 'Perfect Illusion'". Retrieved 17 August 2016. 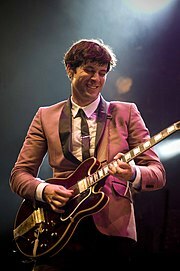 Wikimedia Commons has media related to Mark Ronson.